Image caption Sepp Blatter was close to tears as he urged the staff to "stay strong"
Fifa president Sepp Blatter has been given a 10-minute standing ovation by some 400 staff as he returned to its Zurich headquarters a day after announcing he was to step down. Reportedly close to tears, he urged his "fantastic team" to "stay strong". 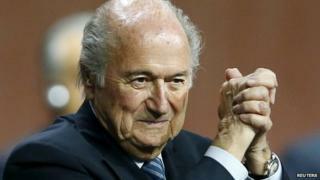 Mr Blatter stood down just days after he was re-elected, amid a corruption scandal engulfing world football. South Africa has meanwhile denied paying a $10m bribe to secure the hosting of the 2010 World Cup. Mr Blatter reportedly addressed staff in the same hall in which he announced he was resigning a day earlier. He emphasised the reform work that Fifa now needed to undertake. Director of communications Walter de Gregorio told the BBC that reform of Fifa's executive committee was key and that members should undergo integrity checks. He said it was not right for the president to say he was unable to monitor all of the executive committee members all of the time. Mr Blatter had made those comments as he responded to the arrest in Switzerland last week of seven senior Fifa members - including two vice-presidents - as they awaited the Fifa congress, arrests that precipitated the latest crisis. They were detained as part of a US prosecution that has indicted 14 people on charges of racketeering and money laundering. The US justice department alleges they accepted bribes and kickbacks estimated at more than $150m (£97m) over a 24-year period. US officials quoted in the New York Times also said on Tuesday that Mr Blatter, 79, was under investigation as part of the inquiry. They said they hoped some of the Fifa figures charged would help to build a case against him. Despite the arrests and the indictments last week, Mr Blatter was re-elected Fifa president two days later. However on Tuesday, Mr Blatter said it appeared his mandate "does not seem to be supported by everyone in the world of football". How can Fifa reform itself? He said he would continue in his post until an extraordinary congress was called to elect a new president. It is expected to take place between December 2015 and March 2016. One outgoing Fifa vice-president, Jim Boyce, told BBC Northern Ireland he did not think Mr Blatter would be found guilty of corruption but that the president should have dealt with "criminals" in his organisation earlier. Australian football chief Frank Lowy said in an open letter on Wednesday that the race to win the 2022 bid, which was awarded to Qatar, was "not clean" and that he had shared what he knew with the authorities. Interpol has issued a wanted persons alert for two former Fifa officials, including Trinidadian former vice-president Jack Warner, as well as four corporate executives. All six were on the list of US indictments last week. South African Sports Minister Fikile Mbalula has meanwhile launched a passionate defence of the country's integrity over its hosting of the 2010 World Cup. US officials allege South Africa paid a $10m bribe in exchange for support for its 2010 bid from Mr Warner and several other members of the North, Central American and Caribbean Association Football (Concacaf). Mr Mbalula denied South Africa had paid a bribe, saying the money in question was above board and went towards an approved programme to support football among the African diaspora in the Caribbean. Mr Mbalula railed against those who sought to be "world policemen", adding "we believe in multilateralism not unilateralism". He added: "It is for the British and the Americans to fight their battles and... we'll never be part of the vested interests. We have fought colonialism and defeated it and we still fight imperialism and we will fight it whenever it manifests itself." The Fifa official named by the New York Times and other media as the person responsible for the transfer of the $10m, secretary general Jerome Valcke, on Wednesday denied any wrongdoing. "I have nothing to blame myself for and I certainly do not feel guilty so I do not even have to justify my innocence," he told the France Info radio station. Unless the electoral process changes dramatically, Asian and African countries will once again be the power brokers. Given anti-European sentiments amongst many nations in those continents, the winner will need to be acceptable to all sides. How has Fifa changed the game of football you play and watch? What are the good and bad things that have happened under Sepp Blatter? Email haveyoursay@bbc.co.uk with your stories. If you would be happy to speak further to a BBC journalist, please include a contact telephone number.